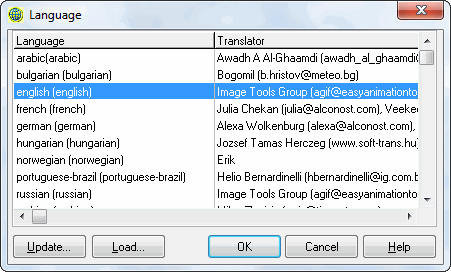 AGIF supports multi-language user interface. Program interface may be seen in one of human languages. It includes menus, screen messages, all texts used in interface. To change language select menu item Help / Language. Select a language and click OK.
Button Update is intended for update of languages from Internet. The program downloads file languages.inf from Internet and compares language files located on site with language files on your computer. New language is checked by flag, availability of updated version of existing language is highlighted. You can check and uncheck necessary languages. Button Install begins loading of checked and highlighted languages from Internet. Button Load is intended for update of languages from packed language files (with extension PLN) if they were already downloaded or delivered by some other way. New and updated languages have separate subfolders in the folder international and contain help files, tutorials and other data.